Amazon killed Lendle – what’s the rest of the story? 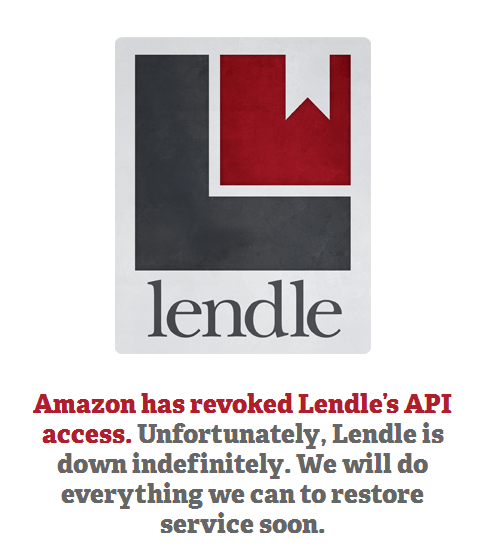 Amazon has revoked Lendle's API access. This is why the site is down. It's sad and unfortunate that Amazon is shutting down Lending sites. According to Amazon, Lendle does not "serve the principal purpose of driving sales of products and services on the Amazon site." I know I'm a few hours behind everyone else on this story, but I was waiting on a response from other ebook lending sites. Yes, there are 7 or so other sites that lend ebooks. I wanted to see if Amazon went after all of them or just Lendle. I've heard back from 4 sites and they are all up and running. The responses ranged from mildly concerned to panicked, naturally. But they haven't heard anything from Amazon. Speaking of which, my source Amazon didn't respond to my email (thanks, Kinley, for ignoring me). So let's move past the fact that this has happened and start trying to figure out why. Something doesn't add up here. All of these sites do the same thing, and all of them benefit Amazon by building value into Kindle ebooks. And yet Amazon only went after the 1 site (so far). Something must set Lendle apart from the other lending sites. What? It could be an accident or mistake on the part of Amazon, for starters. But we won't know until Amazon unbans Lendle, so let's set this one aside. This site could be the most successful, but I don't see why that's relevant. My best guess is that Lendle did something to piss off Amazon. Perhaps Lendle used the API in some way that violated the TaC. We won't know until Amazon responds. Of course, there's a chance that Amazon is going after all the lending sites, but that doesn't seem to be the case. And I don't see why they would. It's a lose-lose situation for Amazon. Customers lose a feature and everyone gets angry at Amazon. Thanks for writing this up. It’s very strange that there’s not much info on this, and Lendle has said that the e-mail came from a “no-reply” address at Amazon – they can’t get more information about this, either, and they really want to work with Amazon on it. The claim that they weren’t “driving sales…” is totally bogus. I don’t even know how Amazon could allow one of its staff members to send that to anyone. Hope more info comes out soon. It’s one more move by Amazon that’s made me want to sell my Kindle for a Nook. Those sites don’t have an API to work with, so they won’t be closed down. And then I’d be able to get books from a variety of sources, including the library and independent booksellers. Whether it drove sales is irrelevant. The lending sites add value simply by existing. Yes, true. But if you’re going to use something irrelevant, it should at least be accurate. This is pure speculation on my part, as I don’t have any idea how Lendle operated and in what manner they used the API. However, I’ll venture a guess since I’m at least somewhat familiar with Amazon APIs from using them myself. Last I checked, there was no way to access a Lending Enabled attribute through the Product Advertising API. If a web service needs to confirm a title’s lendability, then I’m unaware of any way to do so aside from scraping the HTML from the actual product page. This is strictly verbotten in dealing with Amazon. The whole reason for offering an API is to control how data is accessed (and also to varying degrees, how it is used), and any registered developer accessing Amazon.com in an unapproved manner would definitely be putting their continued use of the API in jeopardy. I have no idea if Lendle was guilty of this, but it’s my best guess. What’s the use in going after sites like Lendle though? I suspect Amazon is trying to get more publishers on board the lending train, and that’s hard enough to do when some of the denser publishing minds even consider library lending lost money. When these dunderheads hear of virtual public libraries springing up through lending sites, they must be aghast. Amazon understands that lending helps sales, and may be pursuing a strategy to get the skittish pubs to come around by appearing to be on their side in not wanting virtual libraries to succeed. Acting on API violations would be one way of pursuing that end. The BookLending site has confirmed it’s not affected by this. I hope you didn’t just burn a source by calling them out in your post. I think, Lendle was very different from others – correct me if I’m wrong – in that it allowed the users to connect to their Amazon accounts directly and automate the process of adding the books available for lending onto the lending site. This is crucial and makes lending via Lendle much more effective: imagine you have 20 books to lend, and you need to add them all manually and some of them turn out to be non-lendable. Huge investment of time and no award for that. Moreover, you would probably never even THINK about adding the books you got for free – but believe it or not, the 1 and only book I got to lend so far was a freebie. Who would guess! So, with other sites you get fewer lender-borrower matches just because the books that could be lent aren’t added and, thus, aren’t available. One more thing – Lendle actually REQUIRED you to offer your books for lending before you could make a request, other sites don’t, so, again, the users had an incentive to add their books right away, and so they did. These features made Lendle so different and so much better, and they killed it too. Lendle scrapped the amazon site to pull book information from your library. This is forbidden and so they should be banned. Level playing field for all.